We make pool parties more fun. We are Portland's only synchronized swimming performance troupe. We are making a splash all over town showing off our beautiful sport. It's always summer on our Instagram. See what we are posting about. Rose City Raindrops is proud to partner with Popina, the Northwest's largest swimwear boutique. 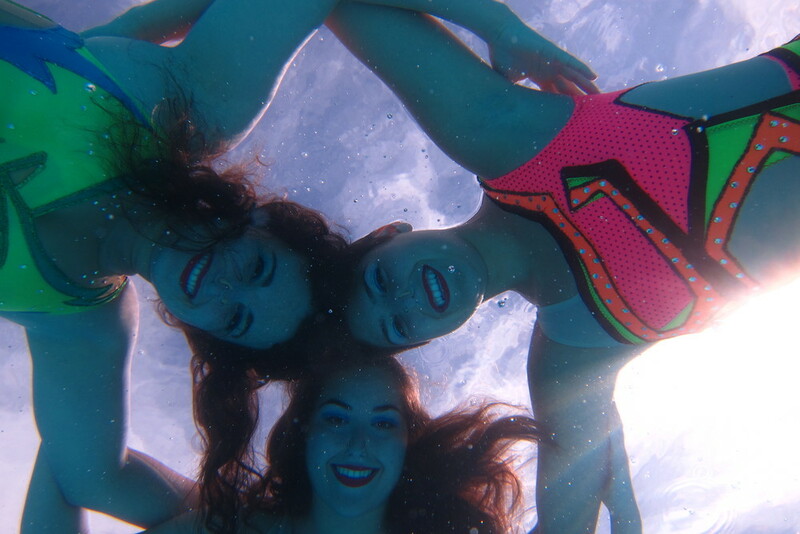 We offer lots of ways to incorporate synchro into your event. We can be the main act or set a glamorous tone while staying in the background. We love teaching synchro to kids... most of us are professional coaches, after all. We can make any pool party more exciting with a synchronized swimming performance. We are happy to adapt our routines to your pool and budget. Want the glamor of synchro but don't want to draw the attention away from the party? Happy to help. Floating is pretty much our favorite thing. Want to give synchronized swimming a try? We can't blame you, it's a lot of fun. We are trained coaches and know how to make learning synchro a blast.